May 11-13 was the Connections Conference held in the beautiful city of San Francisco. This time around I was fortunate enough to make an appearance. Hotel lobby, paper pamphlets, and tacky carpeting greeted me upon arrival. There’s something really cool lurking very close to me, I can feel it… or maybe that’s the electromagnetic field I’m feeling due to all the new home networking devices hidden behind these now closed doors. After three days of seeing just how many different home networking solutions are coming to market in the near future, I’m overwhelmed and extremely excited. I Overwhelmed: I want each technology for my lily pad, but can’t afford every single one. Extremely excited: I will end up splurging on a few of them, and that already puts a smile on my geeky face. Videos of TVs, computers, DVR’s, mobile phones, cars nav systems, cameras, motion detectors, and remote controls all working in conjunction with one another left drool marks on my shirt. This was the first time I heard someone say “megaterrabytes” in a sentence, and I liked it. I talked to people, took a few pictures, and listened to a just a tad too many panel discussions. I did learn that AOL hired the stud who wrote DEAD AIM, a program that remedied the flaws of AOL instant messenger. 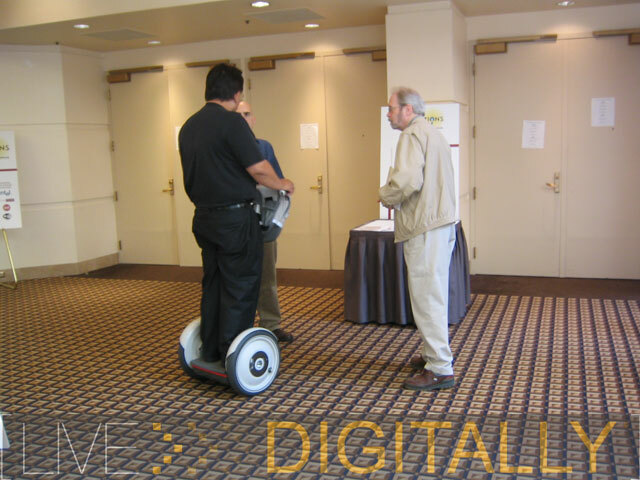 And what nerd conference could go without a segway appearance? Beautiful women’s phone numbers: well… have to sacrifice somewhere right?